Monday 12/5 at Vitus in Oakland at 2nd and Broadway. Doors at 8:00, all ages till 10:00, then 21+. They serve food, so come get dinner. Admission is free! Thanks to Meg for setting this up! 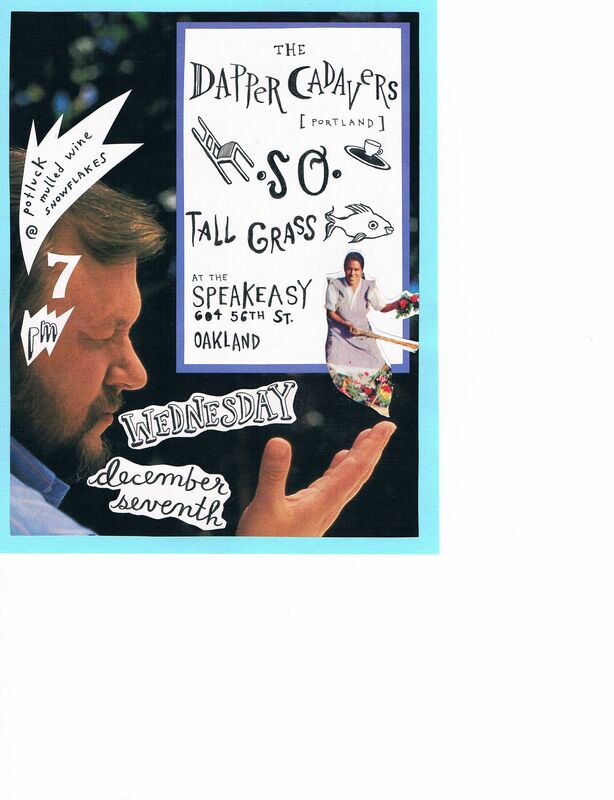 Wednesday 12/7 at the Speakeasy. 604 56th St (and Shattuck) in Oakland. Wintery potluck starts at 7:00. All Ages! Free! W/ The Dapper Cadavers (from Portland) and Tall Grass. Thanks to Rosie for setting this up! Saturday 12/10 at the Crystal Palace. 518 38th Ave. Apt #7, SF. Music starts at 8:00, all ages. Free! We’re recording in the same space the next day, so we’re also going to record this show. If we get good takes they might even make the album. Thanks to Burton for hosting/producing our record!